There is just about no area that graffiti cannot touch. Graffiti is one of the quickest, sneakiest and easiest forms of vandalism around, so it is no wonder that it is everywhere. If your home or business has been hit with an unwanted paint job, our Sylvan Lake graffiti removal can help. Our Gorillas will leave your property looking better than new, so don’t hesitate to give your home or business the clean face that it deserves. There is no way to prevent graffiti artists from leaving their mark on your property but you can make it easier to get rid of. Our Sylvan Lake graffiti removal focuses not only on removing the initial stain but future stains as well. Once our Gorillas are finished stripping paint from your property, we apply an anti-graffiti coating. This coating sits on the exterior areas of your property, creating an invisible barrier between graffiti and your property. This will not prevent graffiti from going on, but it will sure make it easier to clean it off! Instead of struggling with different removal options, our Gorillas know how to clear paint from this coating quickly and easily. Each and every Sylvan Lake graffiti removal begins with assessment and safety procedures. By marking off your property with “Gorillas At Work” signs, and securing affected areas, our Gorillas prevent any runoff. Once the area is secured, our Gorillas begin to treat every element of your stain. Because of its shape, an aerosol can creates overspray as well as bleeding. Tackling the initial stain alone can leave these additional stains behind as well as leaving shadowing behind. 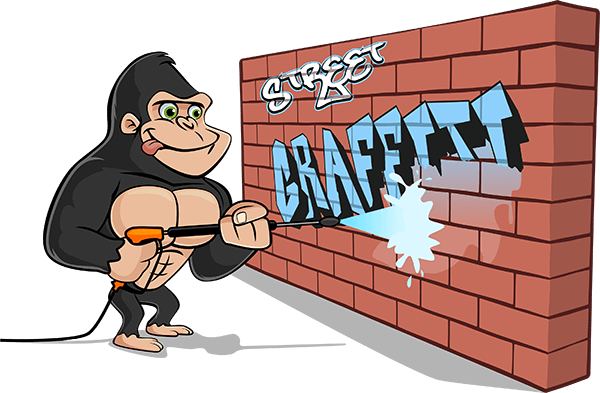 Our Gorillas refuse to let stains ruin our community, so we are committed to removing each and every trace of paint. Sometimes all it takes is a treatment of our Gorilla-Foam cleanser and a good scrubbing but we are ready for heavy-duty removal as well.